A DVD with extreme close ups plus highly detailed and thorough explanations so anyone can learn to play acoustic guitar. 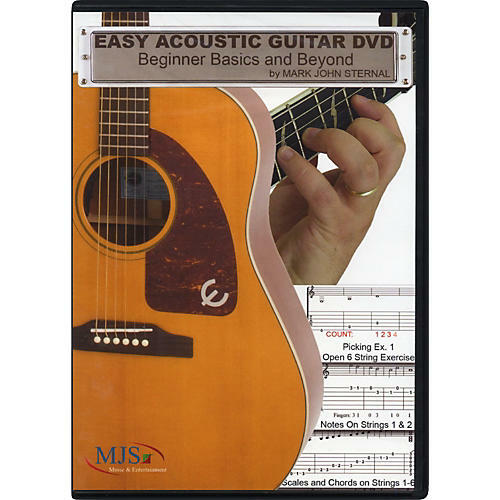 The Easy Acoustic Guitar DVD: Beginner Basics and Beyond gives the beginning guitarist all they need to launch into the world of playing acoustic guitar. The proven lesson content was designed by expert guitar instructor Mark John Sternal to be the fastest and easiest way to learn to play guitar. Tutorials cover how to read guitar music (notation, tablature, and charts). The method is geared to allow the viewer to start playing instantly, learning individual notes, then progressively building up from partial two-string chords to full, six-string chords. In part three of the guitar instructional video, the student will graduate to learn their first five songs in the most popular music styles, including rock, blues and country. Bonus features of the Easy Acoustic Guitar DVD include a built-in metronome and guitar tuner, giant on-screen sheet music, and a showcase of the guitars. Don't miss out on this fast, fun, and easy beginner's DVD for learning the basics of acoustic guitar playing when you order today.